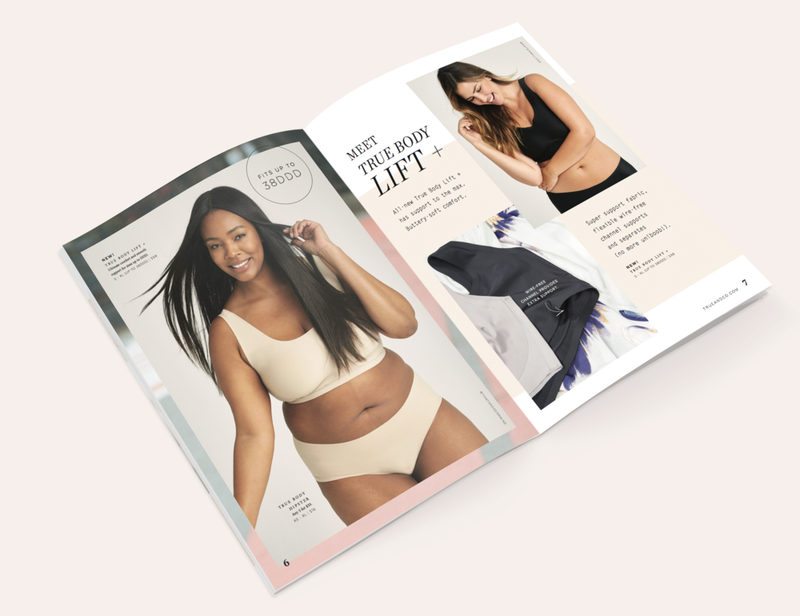 Designed all print marketing material, including monthly catalogs, packaging, and direct mail promotional pieces as Lead Designer at True&Co., an e-commerce intimate apparel brand that aims to design better fitting products using data points from millions of women. Along with our Creative Director and Head of Marketing, designed True&Co. 's monthly catalogs with the goal of showcasing our products and conveying our brand story in a visually stunning way. Modern, clean layouts blended with illustrative, "collage-style" elements helped to promote the products, while extending the brand voice and mission. The catalogs ranged from four to 40 pages. With a distribution of over 600K households monthly, the print catalogs are consistently a top driver in customer acquisition and conversion. Conceptualized and designed direct mail pieces with the goal of increasing customer engagement and brand awareness, including our "Future is Female" drink coasters and a "scratch & win" Valentine's Day promotional tri-fold. By varying the direct mailer concepts, customers were more likely to engage with the piece and convert on our website. Designed brand print pieces, including an updated gift card and in-shipment postcard, from concept to completion. The goal of our these pieces were to ensure they were consistent with our brand look and feel to increase brand awareness and solidify our brand voice.